A research paper1 recently accepted for publication in Physical Review Letters titled “The radial acceleration relation in rotationally supported galaxies”2 highlights a discovery that is bad news for dark matter. It certainly does not strengthen the case for halo dark matter around spiral galaxies. The research team, McGaugh et al, took data for 153 spiral disk galaxies from the Spitzer Photometry and Accurate Rotation Curves (SPARC) database that represents spiral galaxies of all types and morphologies, from very bright to very low surface brightness disks. It included representative spiral galaxies that would be assumed to contain a very high fraction of dark matter at very low orbital accelerations to those with very little dark matter at high orbital accelerations. These galaxies are all assumed to be rotationally supported, which means their disks are assumed to be gravitationally bound by the included matter inside any radial distance (R) from the centre of the galaxy. The speeds of the stars and gases (V) as a function of their measured radial distance (R) determines what is known as a rotation curve V(R). See Fig. 1. In this paper the observed acceleration, gobs, at each radial distance R from the centre of the chosen galaxies, was calculated from the measured values of V(R) and R for each galaxy, totalling 2693 data points over the 153 galaxies. Also using infrared data the mass density was accurately measured at these same radial points, which permitted, via the Poisson equation, a direct calculation of the expected acceleration, gbar, due to the baryonic matter (protons and neutrons, i.e. normal matter) content within the same galaxies. No free fit parameters were used in these estimations, except a single fixed Mass-to-Light ratio of 0.5 was used across all galaxies. 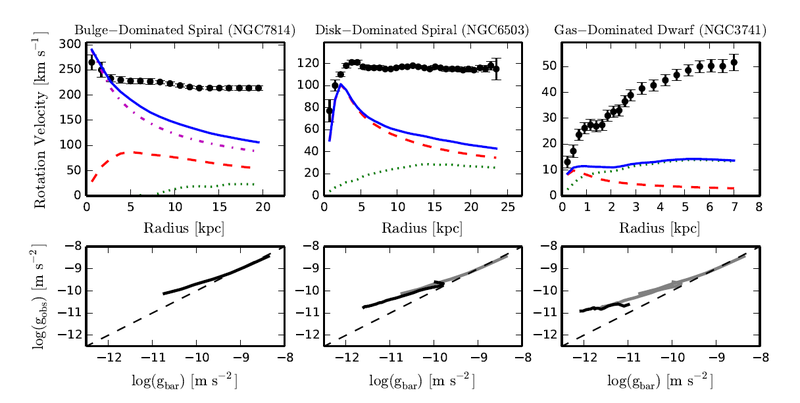 Figure 1: Examples of mass models and rotation curves for individual galaxies. The points with error bars in the upper panels are the observed rotation curves V (R). The errors represent both random errors and systematic uncertainty in the circular velocity due to asymmetry in the velocity field. Each baryonic component is represented: dotted lines for the gas, dashed lines for the stellar disk, and dash-dotted lines for the bulge, when present. The sum of these components is the baryonic mass model (solid line). The lower panels illustrate the run of gbar and gobs for each galaxy, with the dashed line being the line of unity. Note that higher accelerations occur at smaller radii. From left to right each line is replotted in gray to illustrate how progressively fainter galaxies probe progressively lower regimes of acceleration.